Have you seen the new digital series Marcy is doing at Power Poppy? 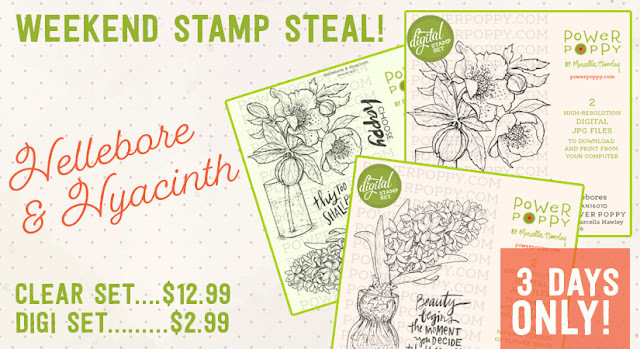 It’s a vintage “Café au Lait” bowl series, filled with new goodies each time! This month she released the second image called My Favorite Pair, it includes a lovely bowl filled with pear fruit, greenery, pretty little african voilets and a lovely little ribbon and note card. It’s such a lovely image. I printed it with a lighter transparency on Arches 80 lb Watercolor paper, and coloured it up with my Zig Clean Colour Brush Markers. I wanted to do a bit of a different colour on the violets and make them more pink and then did a bit of an ombre look to the café au lait bowl in similar colours. 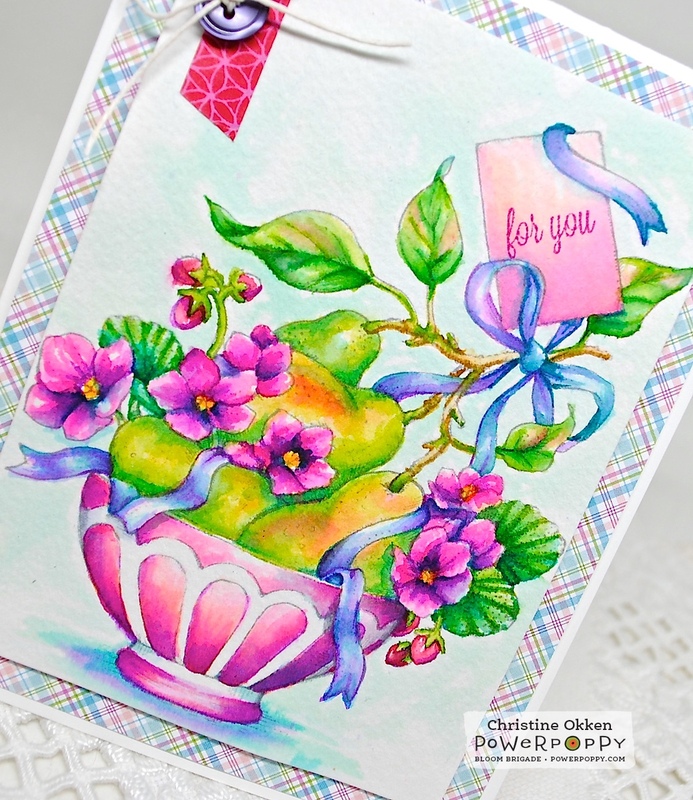 The tiny sentiment on the note card comes from Power Poppy’s Potted Primroses set, stamped in a bright pink ink. Designer paper from MFT, washi tape a button and some twine are all it needs being such a colourful image. Gasp! Beautiful watercolor rendition of this fabulous image! Gorgeous bright colours Christine, that makes this card awesome. I love the designer paper in the same but lighter colours. 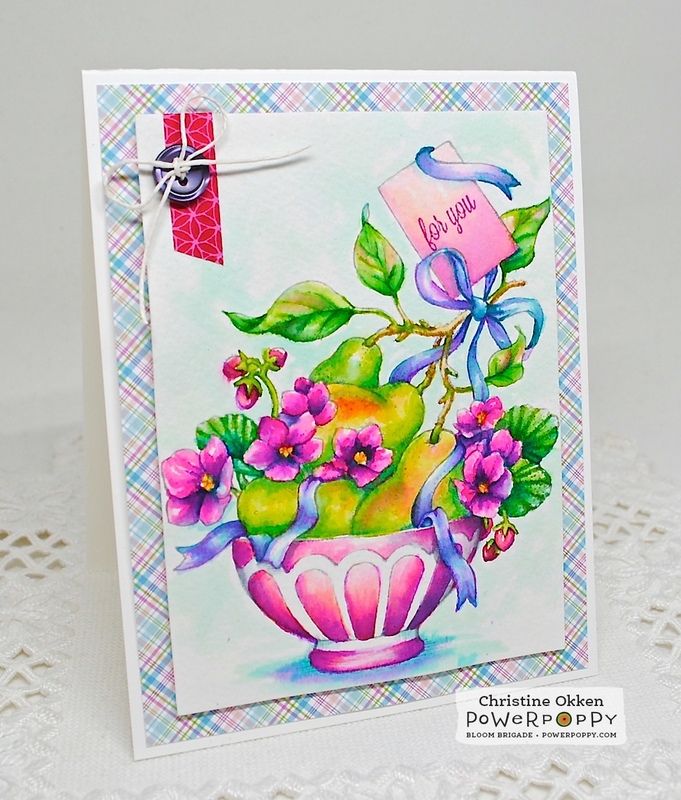 stunning creation Christine, absolutely love your colours you used. Gorgeous... Oh my goodness... your no line coloring is fantastic. And the vibrant colors is just fantastic!! !